Gan Lu aka Sweet Dew tea is the most famous tea from Mount Meng, Sichuan Province in the southwest part of China. This tea is also very nice if you brew it with cold water, great for the hot summer. The tea buds are very tiny and beautiful, the unique character of the tea bush creates a bright green tea color, fresh rich flavor and lingering sweet aftertaste. Fresh, refreshing and has a very sweet aftertaste. 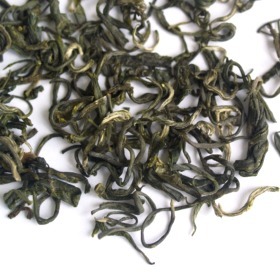 Curly green tea leaves are partially covered with white silvery tips. The infusion yields light yellow liquor.